La Nerthe has one of the most fascinating histories in France. It is located in the famed region of Ch?teauneuf-du-Pape. What is amazing about this property is that it was making wine before the area became known as Ch?teauneuf-du-Pape. The ch?teau at La Nerthe was founded in 1560. Ch?teauneuf-du-Pape didn't become the name of the region until some 50 years later. It seems the King of France was upset with how the Catholic Church was running things in the early 1600s, and installed his own Pope in Avignon, the capital of Ch?teauneuf-du-Pape. The name means the "new castle of the Pope". This duality lasted almost 100 years, until they made up and the Catholic Church was reunited under one Pope in Rome. But by then, the region's reputation was established. The squabbling between the two factions made people take notice of the wine, but the wine stood on its own after the conflict ended. La Nerthe, being probably the oldest estate in the region, was the first ch?teau to be written about for having exceptional wines. In the intervening years, wars and famine took their toll on the property and it fell into disrepair. It was brought back to its original glory in the 1980s by an insurance company -thankfully, headed by a wine lover, who did it all right. 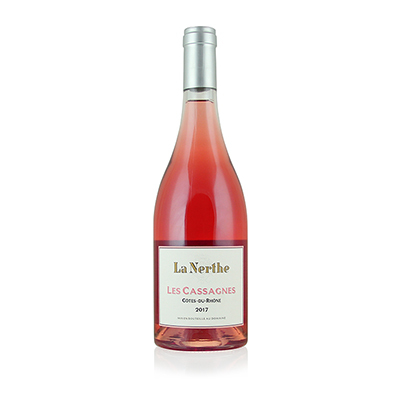 Everything La Nerthe makes is outstanding, and this beauty is no exception. Our selection is most worthy of its history.